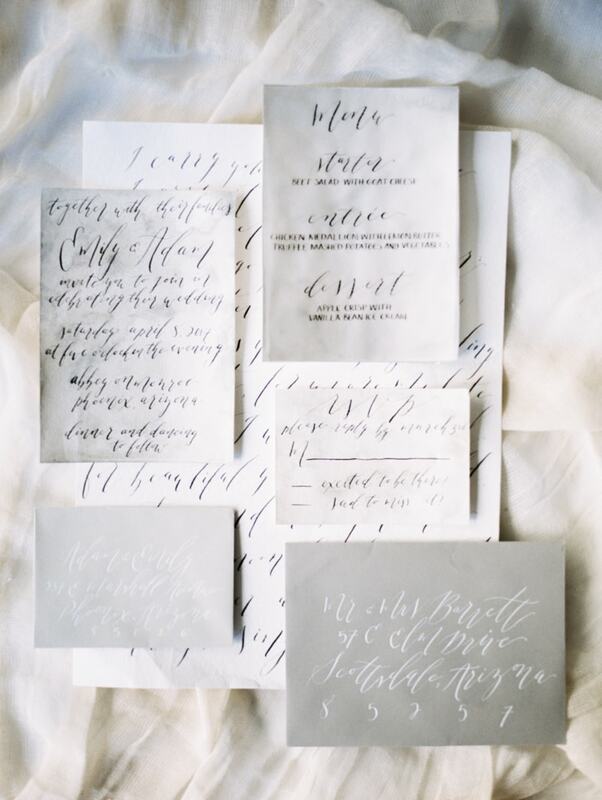 Moody Wedding Inspiration. A moody styled shoot at First Baptist Church in Arizona pulls you in through the enchantment of stories held deep within its aged walls. From the ruins of the fire-stricken church, this shoot comes to life when a couple is forced to solidify their love in an abandoned church. 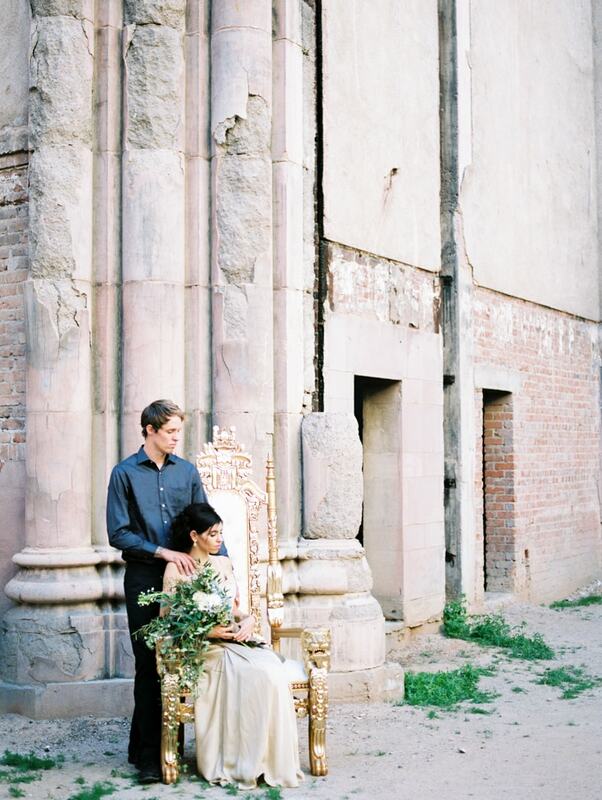 The details of this shoot evoke a somber love story. A black, gray and white invitation suite includes a minimalist design, resembling the celebration of a lost, forbidden love. The bride holds a loose bouquet with glorious size and texture. Its greenery pops against the arid, barren scene of the church. The bride looks radiant in a champagne-colored gown. To complement the strapless neckline, her hair is styled in a modern updo. The groom dons a simple gray shirt and black pants for this sweet and intimate wedding. Aside from the stone and brick weathered by time and the elements, the church walls are held in place by structured steel. And while the church was damaged long ago by fire, what remains is a beautiful foundation being slowly resurrected. The addition of an ornate, gold chair adds an interesting touch, reminding us of the beautiful house of worship it once was and hopefully will be again. A darling church pew for two rests at the center of the floor. To add to her bridal look, the bride accessorizes with a long veil to cover her face. 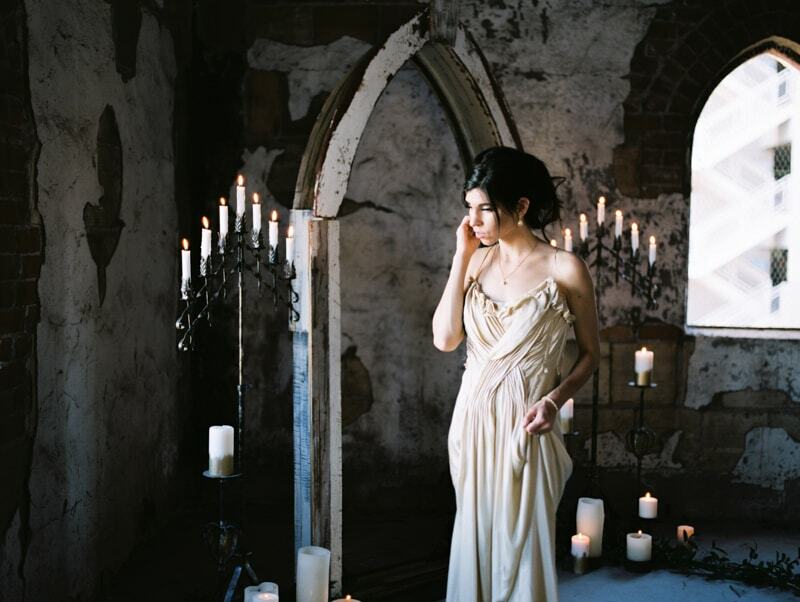 Making her way inside for the ceremony, she is surrounded by the soft glow of candlelight, made brighter by the dark, damaged walls. It’s a lovely scene for a ceremony, where the couple comes together as the light pours in from the open air windows. Even the smallest of weddings is cause for celebration. 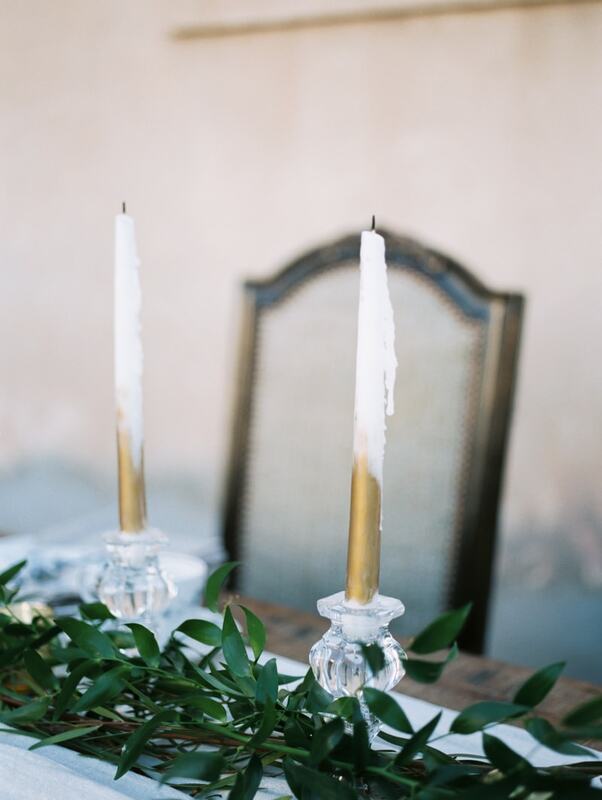 A petite wooden table for two is dressed up with a white linen runner and tall taper candles dipped in gold and greenery. 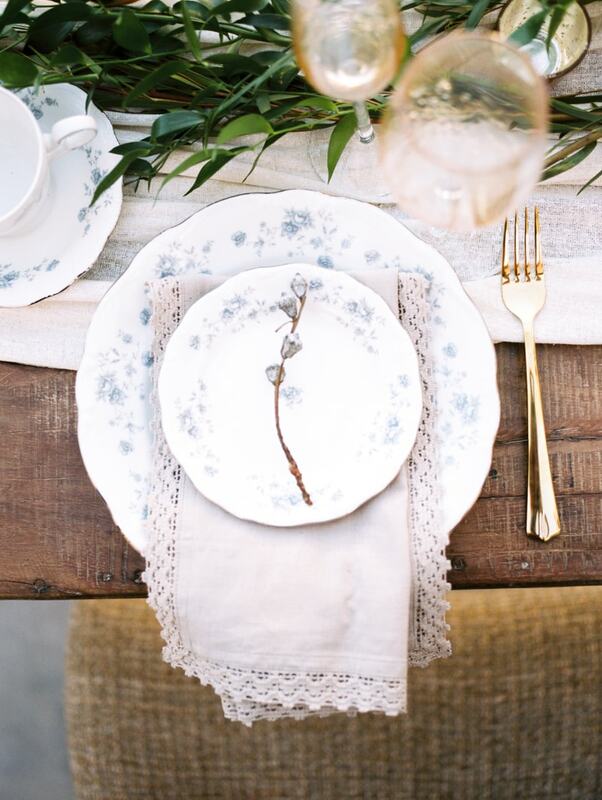 The bride and groom can enjoy a simple meal from delicate china, vintage napkins, gold flatware and colored glassware. Seated in their high-back chairs, the bride and groom now have a new outlook. They can enjoy the bliss of marriage from even the most unlikely of places. Sometimes it takes a tragedy to help us appreciate the true beauty of something. Whether it’s a church brought down in flames or a love once thought lost forever, it’s about rising from the ashes and seizing the joy that awaits. 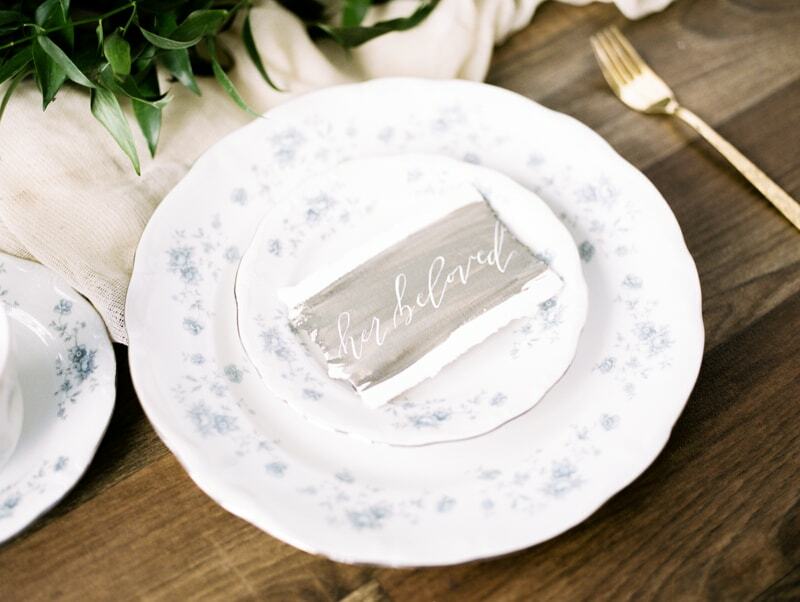 Photographer: Peaches & Twine Photography//Rentals:AZ Retro Rentals//Venue: First Baptist Church//Event Designer: MIRA Events & Design//Dress Store:Shop Gossamer//Ring Box: The Mrs Box//Calligrapher:True North Paper Co.